The first thing you need to consider when you are deciding to cook any type of food is whether you have the required ingredients. Like other specific cuisines, Korean food has it’s own set of ingredients. A lot of the spices and sauces are unique, but most of the vegetables are not. The nice things about Korean cooking is that, in general, the vegetable selection remains standard. Most things are made from carrots, zucchini, potatoes, garlic, onions, green hot peppers, and mushrooms. If you have those on hand, or at least shop for those regularly, you will be able to cook most Korean food if you have the right spices, seasonings, and sauces. These are the building blocks from which all the panchan (반찬-side dishes), soups (국), stews (찌개), and main dishes are made. It’s fair to say, that if you don’t have these, you won’t be able to cook much Korea food. The upside is that most of these so not go bad quickly at all. Korean’s entire diet is based on the time when the only refrigerator you had was a hole in the ground. The northern and colder parts of Korea use less spices in their food than the south, because in the north the colder ground provided more natural preservation. To the southern parts of Korea get more spicy (and in my opinion more tasty) food. So…where were we? Right, buying seasoning. Even if you only want to cook Korean food occasionally, you can do so and your ingredients won’t go bad. Just be careful to never use any spoons or utensils that may have saliva or other unsanitary germs on them. Although the shelf-life is very long on these, if it is contaminated it will go bad quickly. The down side is that purchasing all of it at once could be pricey. My suggestion, of you can afford it, buy it all at once. Korean food is all about the combination of flavors: sweet, spicy, salty, vinegary. If you only buy part of the ingredients, you will get exponentially less flavor. Here’s my advice for buying the products, find a Korean grocery store, or at the very least, an Asian grocery store owned by Koreans. A lot of Korean ingredients are shared with other Asian countries, but the Korean variety has a bit of a unique flavor and is better suited for Korean dishes. This is especially true with vinegar and cooking wine, and to a lesser extent with soy sauce. Sesame oil is hard to differentiate. Also, it’s okay to be a little discriminating when it comes to food quality. I’m obviously not talking about racial discrimination, but about food standards. Korea has very high food standards. Although there are varying degrees of quality within the Korean market as well, you can be certain that even the lower quality products will be made in a clean and sanitary environment. I think the same could be said about Japanese items although the Japanese palette is a bit different than the Korean one. Chinese food is always a gamble. Although I am sure there are good products coming from China, I don’t know enough about the brands to properly differentiate. In general, look for items that say “Made in Korea.” If you are not sure, ask a Korean store clerk. Although there are experts that specialize in food, in general don’t blindly expect a Thai, Japanese, or Chinese person to know the intricacies of Korean ingredients. The reverse is also true. Okay, enough commentary. Soy Sauce is used in just about everything. Korean Soy Sauce seems to me to have a little more flavor it’s Japanese and Chinese counterpart, but that’s purely subjective. Almost all Japanese soy sauces, and some Chinese, contain a lot of wheat as an ingredient, Korean soy sauce does not and it is made from entirely Soy (although the rice plant it self is used as a wrapping to start the fermentation process). This is not to place superiority on one product over the other, just to point out that the differences in design effect the way the flavors mix with the food you are making. 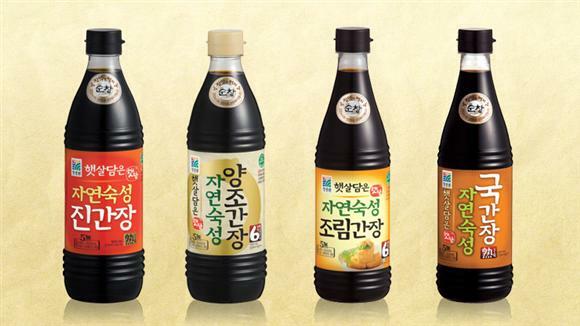 Soy Sauce is a major ingredient in many Korean foods, for a genuine Korean taste, use genuine Korean ingredients. 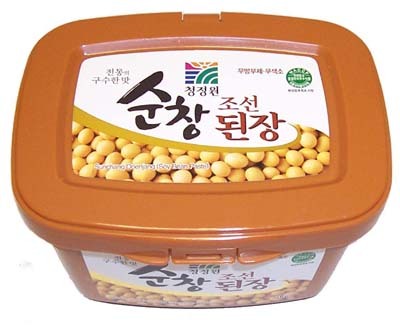 Good quality Korean brands are naturally matured and are a by product of the making of Fermented Soy Bean Paste (seen below) and not chemically made. The Wal-Mart, La Choy-type brands are all chemicals. Avoid it. It’s junk. Above you see four types of Soy Sauces. The most common one used in cooking, and the one I will use in my recipes is the first one: Jin Gan Jang. I used the brand above and it is good, but the most common one you will find in the United States is the brand Sam Pyo. Use their Gold-S Jin. The second one above is said to be for brewing and distilling. I have not used it so I can’t comment. The third one is for reducing or simmered products. 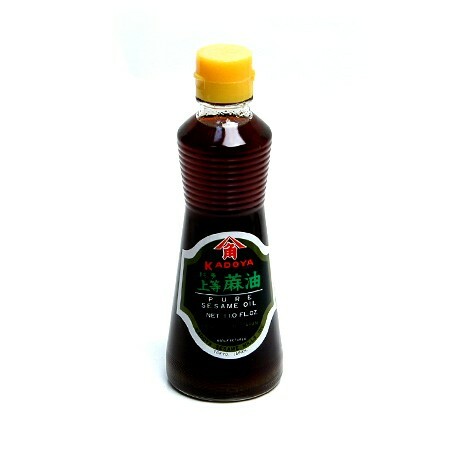 It is less salty and has a nice flavor, but it is a niche soy sauce you can get similar taste just by mixing Jin soy sauce with water in a 1:1 or 1:2 ratio. 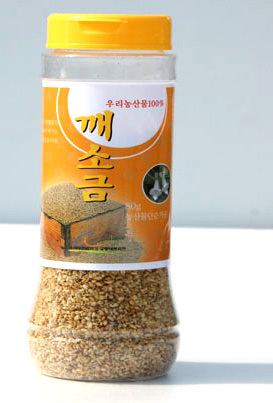 The forth one is perhaps the second most common one in Korea and also easily found in the United States; it is for making soup. This is a great alternative for Fish Sauce for those who do not like the flavor. For now, just buy the Jin. As you expand your cooking and see a need, you can buy the others. You don’t need to refrigerate this, just keep in the the cup-board. If Korean cooking were the blues, this paste would be all the despair, oppression, and depression that causes such a beautiful outcome. It’s not something to eat on it’s own, but mix it with a few other ingredients and you have some genuine Korean flavor. It’s spicy, but it’s not a refined spicy. If your looking for a clean, fresh spicy additive, you’ll use the crushed pepper flakes below; but this has it’s own, deep character. There not a lot of varieties to mention besides perhaps particular brand flavor. 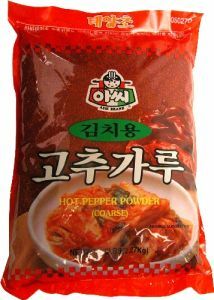 Just be a little careful not to accidentally purchase the vinegar red pepper paste (directly below) or the one specifically for bi bim bap. There is also a “less spicy” version around that doesn’t sacrifice much in the way of taste if you have a bit of an aversion to heat. In the USA there are a few varieties manufactured in California. You can even find this product in Wal-Mart these days in certain cities. While it still tastes decent, spending the extra dollar or two for a genuine Korean product will give you a bit more genuine flavor. While not always the case, the USA made versions often cater a bit to the American, or at least the Americanized-Korean, taste-bud. But, if you do buy the Korean version, especially at a smaller store, be sure to check the expiration date, get one that has a good 6 months on it, if not a year. Keep refrigerated. This one is purely optional. Although I have not done it myself, out of pure laziness, it is easy to make from the above mentioned red pepper paste. Home-made versions taste much better than store bought ones, even in Korea, but unless you know what the original tastes like, it can be a bit difficult to replicate. I want to make this soon on my own, when I do, I’ll post it on here. I have made variations of this sauce as you will see when I post the recipes for Jjul-myeon, Spicy Fried Squid Side Dish, or Fried Dumpling Salad. I would say that this is the ketchup of Korea, but they learned from us to enjoy ketchup as well. It’s a great sauce with many things, lots of flavor, but again it’s not a fresh, clean feeling food. Keep refrigerated. This is a pretty self explanatory, sun-dried crushed hot pepper. It’s in Kim Chi; it’s in the fermented red pepper paste above, and it will be in almost everything you make. It’s also packed full of all sorts of vitamins, antioxidants, and flavor. The bags these come in are pretty big. Enough for quite some time. To keep the flavor fresh, break it in into portions of about one cup each, double or triple bag them to avoid freezer burn, and keep it in the freezer. Make sure each bag has as little air as possible. This is the health food of Korea. Although that’s a little redundant. It is hearty, it tastes like home even if you never grew up with it, and it’s full of all sorts of amazing, hearty vitamins and minerals. Soy beans are great for you, and this is soy beans on steroids. This is similar to the Japanese miso, but the creation process is different and to the flavor differs in the same extent as does soy sauce because soy sauce is a by product of the creation of doen jang or miso respectively. There are huge health benefits to doen jang. There are many claims about the benefits of doen jang that are substantiated to various degrees, I would encourage you do reseach it on your own to find the level of validity of each claim. Here are a few: cancer prevention through the high level of isoflavones; linolenic acid to lower blood pressure (although be careful of the high salt content that could reverse this effect); strengthening of the liver; isojlavin and melanoidin as an anti-oxidant; lecithin and saponin to prevent dementia; isoflavone to prevent osteoporosis; plus a lot of protein and amino acids. 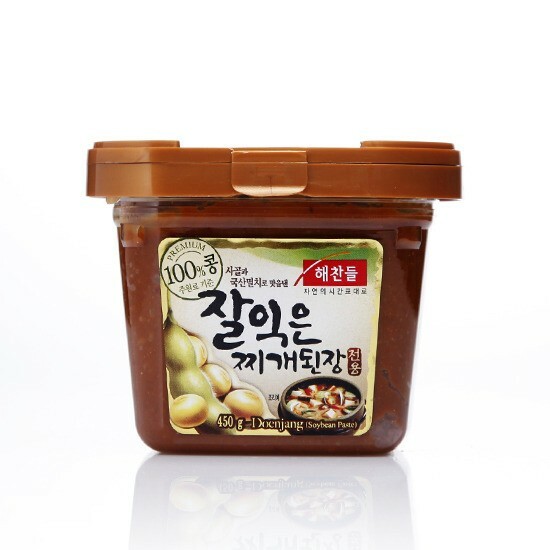 The picture above is the standard doenjang. But, it needs a little a few additives to make it useful for soup and other uses. So, if you can find it, buy the product below. It has all the flavors needed for soup built in. Ask your Korean store for “doen jang used for making soups and stews” and they should direct you if they have it. I love this food so much it’s hard for me to keep it in. Once you make good stew with it, you’ll love it too. Like the vinegar red pepper paste above, I want to make the doen-jang for soups seen above, but I just haven’t yet. When I do, I’ll let you know. This is another one that is possible to make on your own, but not nearly as easy. It’s one of my favorite sauces, but mainly only used with lettuce wraps. There are other ways to use it, but it one of the ingredients you can wait to buy until a recipe calls for it. Basically, it is red pepper paste, bean paste, garlic, sesame oil, sugar, onion, and green onions. Some people put a peanuts or other nuts in it. Because it’s not as commonly used, you can find it in a smaller size, buy that first, see how you like it, and then try to make it for yourself. Keep refrigerated. This is the ingredient that I’m the most hesitant about because I haven’t tried enough to adequately explain it. I do know that processes of and the ingredients for making vinegar vary between Asian countries. 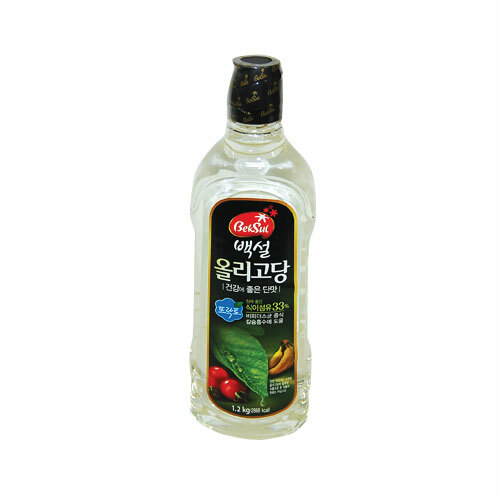 Korean vinegar is clean, pure, and almost tasteless even though it has a distinctive bite. You could almost drink it straight. Japanese or Chinese vinegar will give you a fermented flavor and that it not what you want with Korean foods. 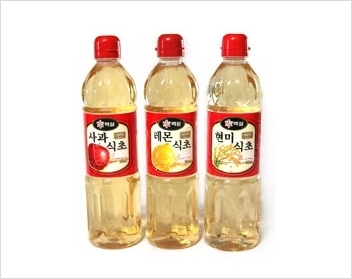 From left to right above there is Apple, lemon, and rice vinegar. I don’t know which one to tell you to buy to be honest. I know the bottle of the one I always bought in Korea, but I don’t remember which it was 100%. I think it was apple. In the USA at my local Korean store, they guided me to a USA made product that tastes almost identical. The problem is that if you buy the wrong vinegar your flavor will be all off. Ask the store. Tell them you want a clear, crisp, almost tasteless vinegar. They will guide you. If you can see into the bottle, the vinegar you want in clear, not yellow, not brown, but clear. When you smell it, it should not have any “rotten” smell at all. This is essential, but the Japanese and the Korean version taste almost identical. I can’t speak to other countries. The bottle above is very common and even found at Wal-Mart from time to time. 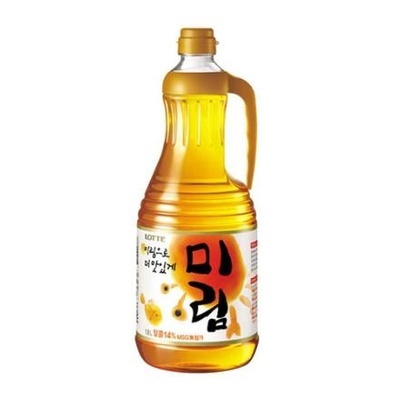 I’m not sure if this is an acquired taste or not, when I first started experimenting with Korean food before I went to Korea, I didn’t like the taste of this oil, but now it is one of the most representative, distinct, and appreciated flavors. There’s a very high possibility that I was using it wrong. This is almost always the last part of a recipe to be mixed or spread. If you try to fry with it, it changes the flavor. It’s a dark and full flavor. It’s not corn syrup. It’s olgosaccharide. We don’t use it in cooking in America that much. But it is a great sugar for your health. In fact, I think your local Korean store may be the only place to buy this sugar retail. There are four different types of sugar that are commonly used in Korean recipes: Corn Syrup (물엿), Rice Syrup (쌀엿), Cooking Sugar (요리당), and olgosaccharide (올리고당). They are usually interchangeable but I will mention the differences for your choosing. Corn Syrup is what we eat in all our American junk food. When I was researching the differences one expert commented: “Corn syrup is the same as a 21-gun salute.” It’s an awkward translation, but you get the picture, it’s death in a shiny, smooth sugary liquid. Rice Syrup is a more traditional Korean sweetener. Where corn and sugar cane are common in the Americas, rice is in Korea. Traditional flavor, but I can’t find much more than that. Cooking sugar is a bit sweeter than all of these and so it reserved for certain applications. It’s not very healthy as it appears to be a boiled down mutt mix of corn syrup and other sweeteners. This Korean wine is best suited for Korean dishes, usually used with meats and fish, but also used in some sauce making. When tenderizing meat and fish, the flavor does not matter much so this can be substituted for any other wine. This is about 14% alcohol so very your recipe accordingly depending on how strong the wine is. 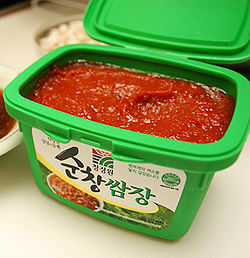 However, when making certain sauces you may not cook it before eating, the flavor will stay and in that case I recommend using a Korean product if you are looking for an authentic taste. For being an alcoholic product it is not very expensive. Last but certainly not least is the toasted sesame seeds. In my local Korean store they do not have a Korean product so I choose the Chinese product over a Mexican one. I cannot speak to the Mexican product, but the Chinese product seemed fine, although it was a bit saltier then the Korean version. This is a garnish and it serves the purpose of both decoration, adding a little flavor, and adding a little crunch. Often a recipe will call for just toasted sesame seeds, you can substitute this product in for that. The salt content is so low, when I first tasted it I was confused why it was labeled “salt.” It is a tad salty, but you would have to eat quite a bit to notice. As I add recipes that need more ingredient explanation, come here to look. I will guide you to what to buy, or make. In the mean time, have a little fun stocking your Korean cupboard. Corn syrup laden cuisine-one reason my Korean husband and I avoid it nearly altogether now. Junk food is junk food whether it comes in a cookie or soup form. 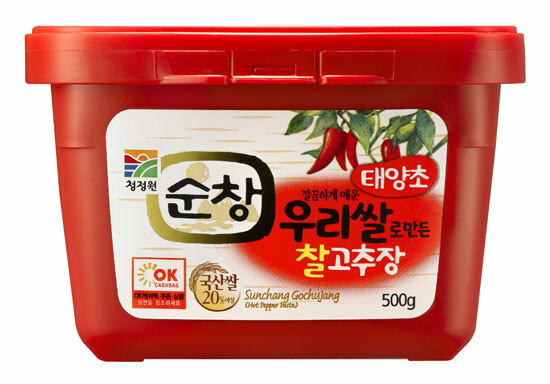 Where do you find the authentic Korean red pepper flakes NOT FROM CHINA? THAT is the million dollar question of taste. The best way to to pack your bags full from Seoul as we did last summer…then throw it in the fridge. I can’t explain the difference in taste. Amazingly fresh and bright flavor. If you can find an H-mart in your area it’s possible they may have some. I don’t have the answer…but you sure are asking the RIGHT question! I just returned from Seoul with a bag of red pepper. The best department store chain, Hyundai has it for about $53 (60,000 Won) for a bag of 1 Kg (2,2 lbs.). I went to another chain of supermarkets and paid 26,000 Won (about $22) for 1Kg bag. You cannot buy it in the U.S.